Aripiprazole with NDC 70518-1870 is a a human prescription drug product labeled by Remedyrepack Inc.. The generic name of Aripiprazole is aripiprazole. The product's dosage form is tablet and is administered via oral form. FDA Application Number: ANDA202101 What is the FDA Application Number? [see WARNINGS AND PRECAUTIONS (5.3)]. [see CLINICAL STUDIES (14.1)]. Patients should be periodically reassessed to determine the continued need for maintenance treatment. [see CLINICAL STUDIES (14.1)]. Patients should be periodically reassessed to determine the need for maintenance treatment. Aripiprazole Tablets, USP are available as described in Table 2. [see BOXED WARNING]. Safety Experience in Elderly Patients with Psychosis Associated with Alzheimer’s DiseaseIn three, 10-week, placebo-controlled studies of aripiprazole in elderly patients with psychosis associated with Alzheimer’s disease (n=938; mean age: 82.4 years; range: 56 to 99 years), the adverse events that were reported at an incidence of ≥3% and aripiprazole incidence at least twice that for placebo were lethargy [placebo 2%, aripiprazole 5%], somnolence (including sedation) [placebo 3%, aripiprazole 8%], and incontinence (primarily, urinary incontinence) [placebo 1%, aripiprazole 5%], excessive salivation [placebo 0%, aripiprazole 4%], and lightheadedness [placebo 1%, aripiprazole 4%]. Patients with major depressive disorder (MDD), both adult and pediatric, may experience worsening of their depression and/or the emergence of suicidal ideation and behavior (suicidality) or unusual changes in behavior, whether or not they are taking antidepressant medications, and this risk may persist until significant remission occurs. Suicide is a known risk of depression and certain other psychiatric disorders, and these disorders themselves are the strongest predictors of suicide. There has been a long-standing concern, however, that antidepressants may have a role in inducing worsening of depression and the emergence of suicidality in certain patients during the early phases of treatment. Pooled analyses of short-term placebo-controlled trials of antidepressant drugs (SSRIs and others) showed that these drugs increase the risk of suicidal thinking and behavior (suicidality) in children, adolescents, and young adults (ages 18to 24) with MDD and other psychiatric disorders. Short-term studies did not show an increase in the risk of suicidality with antidepressants compared to placebo in adults beyond age 24; there was a reduction with antidepressants compared to placebo in adults aged 65 and older. The pooled analyses of placebo-controlled trials in children and adolescents with MDD, Obsessive Compulsive Disorder (OCD), or other psychiatric disorders included a total of 24 short-term trials of 9 antidepressant drugs in over 4400 patients. The pooled analyses of placebo-controlled trials in adults with MDD or other psychiatric disorders included a total of 295 short-term trials (median duration of 2 months) of 11 antidepressant drugs in over 77,000 patients. There was considerable variation in risk of suicidality among drugs, but a tendency toward an increase in the younger patients for almost all drugs studied. There were differences in absolute risk of suicidality across the different indications, with the highest incidence in MDD. The risk differences (drug vs. placebo), however, were relatively stable within age strata and across indications. These risk differences (drug-placebo difference in the number of cases of suicidality per 1000 patients treated) are provided in Table 3. ≥65 6 fewer caseNo suicides occurred in any of the pediatric trials. There were suicides in the adult trials, but the number was not sufficient to reach any conclusion about drug effect on suicide. It is unknown whether the suicidality risk extends to longer-term use, ie, beyond several months. However, there is substantial evidence from placebo-controlled maintenance trials in adults with depression that the use of antidepressants can delay the recurrence of depression. All patients being treated with antidepressants for any indication should be monitored appropriately and observed closely for clinical worsening, suicidality, and unusual changes in behavior, especially during the initial few months of a course of drug therapy, or at times of dose changes, either increases or decreases. The following symptoms, anxiety, agitation, panic attacks, insomnia, irritability, hostility, aggressiveness, impulsivity, akathisia (psychomotor restlessness), hypomania, and mania, have been reported in adult and pediatric patients being treated with antidepressants for MDD as well as for other indications, both psychiatric and nonpsychiatric. Although a causal link between the emergence of such symptoms and either the worsening of depression and/or the emergence of suicidal impulses has not been established, there is concern that such symptoms may represent precursors to emerging suicidality. Consideration should be given to changing the therapeutic regimen, including possibly discontinuing the medication, in patients whose depression is persistently worse, or who are experiencing emergent suicidality or symptoms that might be precursors to worsening depression or suicidality, especially if these symptoms are severe, abrupt in onset, or were not part of the patient’s presenting symptoms.Families and caregivers of patients being treated with antidepressants for major depressive disorder or other indications, both psychiatric and nonpsychiatric, should be alerted about the need to monitor patients for the emergence of agitation, irritability, unusual changes in behavior, and the other symptoms described above, as well as the emergence of suicidality, and to report such symptoms immediately to healthcare providers. Such monitoring should include daily observation by families and caregivers. Prescriptions for aripiprazole should be written for the smallest quantity of tablets consistent with good patient management, in order to reduce the risk of overdose. Screening Patients for Bipolar Disorder : A major depressive episode may be the initial presentation of bipolar disorder. It is generally believed (though not established in controlled trials) that treating such an episode with an antidepressant alone may increase the likelihood of precipitation of a mixed/manic episode in patients at risk for bipolar disorder. Whether any of the symptoms described above represent such a conversion is unknown. However, prior to initiating treatment with an antidepressant, patients with depressive symptoms should be adequately screened to determine if they are at risk for bipolar disorder; such screening should include a detailed psychiatric history, including a family history of suicide, bipolar disorder, and depression. [see ADVERSE REACTIONS (6.1, 6.2)]. Although fewer patients have been treated with aripiprazole, it is not known if this more limited experience is the sole reason for the paucity of such reports. Assessment of the relationship between atypical antipsychotic use and glucose abnormalities is complicated by the possibility of an increased background risk of diabetes mellitus in patients with schizophrenia and the increasing incidence of diabetes mellitus in the general population. Given these confounders, the relationship between atypical antipsychotic use and hyperglycemia-related adverse events is not completely understood. However, epidemiological studies which did not include aripiprazole suggest an increased risk of hyperglycemia-related adverse reactions in patients treated with the atypical antipsychotics included in these studies. Because aripiprazole was not marketed at the time these studies were performed, it is not known if aripiprazole is associated with this increased risk. Precise risk estimates for hyperglycemia-related adverse events in patients treated with atypical antipsychotics are not available. AdultsIn an analysis of 13 placebo-controlled monotherapy trials in adults, primarily with schizophrenia or another indication, the mean change in fasting glucose in aripiprazole-treated patients (+4.4 mg/dL; median exposure 25 days; N=1057) was not significantly different than in placebo-treated patients (+2.5 mg/dL; median exposure 22 days; N=799). Table 4 shows the proportion of aripiprazole-treated patients with normal and borderline fasting glucose at baseline (median exposure 25 days) that had treatment-emergent high fasting glucose measurements compared to placebo-treated patients (median exposure 22 days). Pediatric Patients and AdolescentsIn an analysis of two placebo-controlled trials in adolescents with schizophrenia (13 to 17 years) and pediatric patients with another indication (10 to 17 years), the mean change in fasting glucose in aripiprazole-treated patients (+4.8 mg/dL; with a median exposure of 43 days; N=259) was not significantly different than in placebo-treated patients (+1.7 mg/dL; with a median exposure of 42 days; N=123). 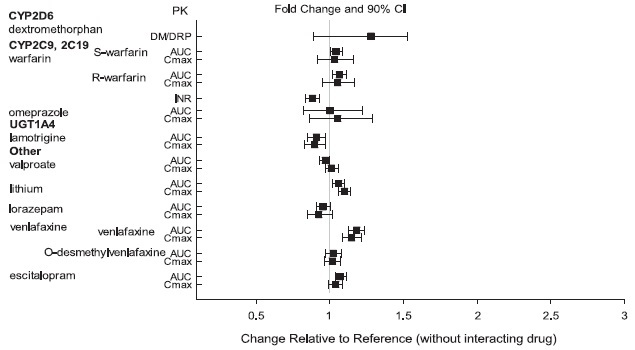 At 12 weeks in the pooled adolescent schizophrenia and other indication trials, the mean change in fasting glucose in aripiprazole-treated patients was not significantly different than in placebo-treated patients [+2.4 mg/dL (n=81) and +0.1 mg/dL (n=15), respectively]. DyslipidemiaUndesirable alterations in lipids have been observed in patients treated with atypical antipsychotics. Table 6 shows the proportion of adult patients, primarily from pooled schizophrenia and another indication monotherapy placebo-controlled trials, with changes in total cholesterol (pooled from 17 trials; median exposure 21 to 25 days), fasting triglycerides (pooled from eight trials; median exposure 42 days), fasting LDL cholesterol (pooled from eight trials; median exposure 39 to 45 days, except for placebo-treated patients with baseline normal fasting LDL measurements, who had median treatment exposure of 24 days) and HDL cholesterol (pooled from nine trials; median exposure 40 to 42 days). In monotherapy trials in adults, the proportion of patients at 12 weeks and 24 weeks with changes from Normal to High in total cholesterol (fasting/nonfasting), fasting triglycerides, and fasting LDL cholesterol were similar between aripiprazole- and placebo-treated patients: at 12 weeks, Total Cholesterol (fasting/nonfasting), 1/71 (1.4%) vs. 3/74 (4.1%); Fasting Triglycerides, 8/62 (12.9%) vs. 5/37 (13.5%); Fasting LDL Cholesterol, 0/34 (0%) vs. 1/25 (4%), respectively; and at 24 weeks, Total Cholesterol (fasting/nonfasting), 1/42 (2.4%) vs. 3/37 (8.1%); Fasting Triglycerides, 5/34 (14.7%) vs. 5/20 (25%); Fasting LDL Cholesterol, 0/22 (0%) vs. 1/18 (5.6%), respectively. Pediatric Patients and AdolescentsTable 7 shows the proportion of adolescents with schizophrenia (13 to 17 years) and pediatric patients with another indication (10 to 17 years) with changes in total cholesterol and HDL cholesterol (pooled from two placebo-controlled trials; median exposure 42 to 43 days), and fasting triglycerides (pooled from two placebo-controlled trials; median exposure 42 to 44 days). In monotherapy trials of adolescents with schizophrenia and pediatric patients with another indication, the proportion of patients at 12 weeks and 24 weeks with changes from Normal to High in total cholesterol (fasting/nonfasting), fasting triglycerides, and fasting LDL cholesterol were similar between aripiprazole- and placebo-treated patients: at 12 weeks, Total Cholesterol (fasting/nonfasting), 0/57 (0%) vs. 0/15 (0%); Fasting Triglycerides, 2/72 (2.8%) vs. 1/14 (7.1%), respectively; and at 24 weeks, Total Cholesterol (fasting/nonfasting), 0/36 (0%) vs. 0/12 (0%); Fasting Triglycerides, 1/47 (2.1%) vs. 1/10 (10%), respectively. Weight GainWeight gain has been observed with atypical antipsychotic use. Clinical monitoring of weight is recommended. AdultsIn an analysis of 13 placebo-controlled monotherapy trials, primarily from pooled schizophrenia and another indication, with a median exposure of 21 to 25 days, the mean change in body weight in aripiprazole-treated patients was +0.3 kg (N=1673) compared to –0.1 kg (N=1100) in placebo-controlled patients. At 24 weeks, the mean change from baseline in body weight in aripiprazole-treated patients was –1.5 kg (n=73) compared to –0.2 kg (n=46) in placebo-treated patients. Table 8 shows the percentage of adult patients with weight gain ≥7% of body weight by indication. a4 to 6 weeks duration. In an analysis of two placebo-controlled trials in adolescents with schizophrenia (13 to 17 years) and pediatric patients with another indication(10 to 17 years) with median exposure of 42 to 43 days, the mean change in body weight in aripiprazole-treated patients was +1.6 kg (N=381) compared to +0.3 kg (N=187) in placebo-treated patients. 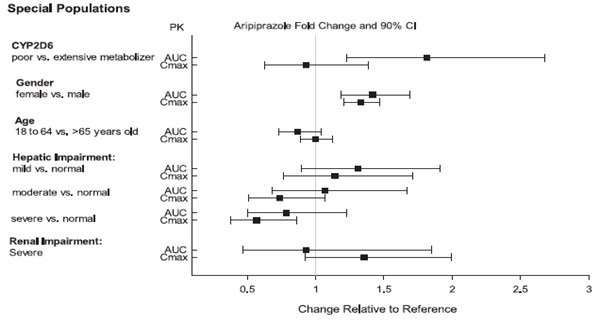 At 24 weeks, the mean change from baseline in body weight in aripiprazole-treated patients was +5.8 kg (n=62) compared to +1.4 kg (n=13) in placebo-treated patients. Table 9 shows the percentage of pediatric and adolescent patients with weight gain ≥7% of body weight by indication. In an open-label trial that enrolled patients from the two placebo-controlled trials of adolescents with schizophrenia (13 to 17 years) and pediatric patients with another indication(10 to 17 years), 73.2% of patients (238/325) completed 26 weeks of therapy with aripiprazole. After 26 weeks, 32.8% of patients gained ≥7% of their body weight, not adjusted for normal growth. To adjust for normal growth, z-scores were derived (measured in standard deviations [SD]), which normalize for the natural growth of pediatric patients and adolescents by comparisons to age- and gender-matched population standards. A z-score change <0.5 SD is considered not clinically significant. After 26 weeks, the mean change in z-score was 0.09 SD. 1-adrenergic receptor antagonism. The incidence of orthostatic hypotension-associated events from short-term, placebo-controlled trials of adult patients on oral aripiprazole (n=2467) included (aripiprazole incidence, placebo incidence) orthostatic hypotension (1%, 0.3%), postural dizziness (0.5%, 0.3%), and syncope (0.5%, 0.4%); of pediatric patients 6 to 18 years of age (n=732) on oral aripiprazole included orthostatic hypotension (0.5%, 0%), postural dizziness (0.4%, 0%), and syncope (0.2%, 0%) . [see ADVERSE REACTIONS (6.1)] The incidence of a significant orthostatic change in blood pressure (defined as a decrease in systolic blood pressure ≥20 mmHg accompanied by an increase in heart rate ≥25 when comparing standing to supine values) for aripiprazole was not meaningfully different from placebo (aripiprazole incidence, placebo incidence): in adult oral aripiprazole-treated patients (4%, 2%), in pediatric oral aripiprazole-treated patients aged 6 to 18 years (0.4%, 1%). In clinical trial and/or postmarketing experience, events of leukopenia/neutropenia have been reported temporally related to antipsychotic agents, including aripiprazole. Agranulocytosis has also been reported. Possible risk factors for leukopenia/neutropenia include pre-existing low white blood cell count (WBC)/absolute neutrophil count (ANC) and history of drug-induced leukopenia/neutropenia. Patients with a history of a clinically significant low WBC/ANC or drug-induced leukopenia/neutropenia, perform a complete blood count (CBC) monitored frequently during the first few months of therapy. In such patients, consider discontinuation of aripiprazole at the first sign of a clinically significant decline in WBC in the absence of other causative factors.Monitor patients with clinically significant neutropenia for fever or other symptoms or signs of infection and treat promptly if such symptoms or signs occur. Discontinue aripiprazole in patients with severe neutropenia (absolute neutrophil count <1000/mm3) and follow their WBC counts until recovery. 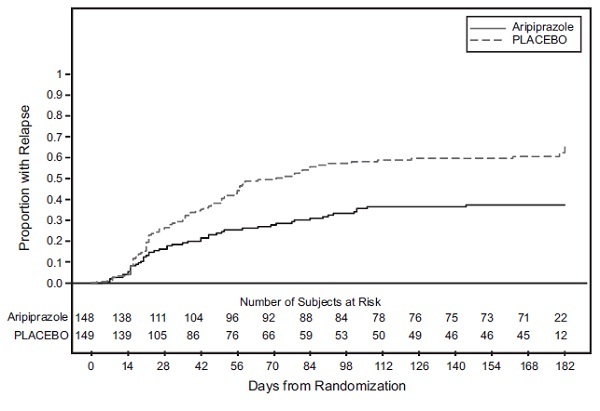 In short-term, placebo-controlled trials, seizures/convulsions occurred in 0.1% (3/2467) of adult patients treated with oral aripiprazole, in 0.1% (1/732) of pediatric patients (6 to 18 years). Aripiprazole, like other antipsychotics, may have the potential to impair judgment, thinking, or motor skills. For example, in short-term, placebo-controlled trials, somnolence (including sedation) was reported as follows (aripiprazole incidence, placebo incidence): in adult patients (n=2467) treated with oral aripiprazole (11%, 6%), in pediatric patients ages 6 to 17 (n=611) (24%, 6%). Somnolence (including sedation) led to discontinuation in 0.3% (8/2467) of adult patients and 3% (20/732) of pediatric patients (6 to 18 years) on oral aripiprazole in short-term, placebo-controlled trials. [see ADVERSE REACTIONS (6.1, 6.2)]. [see WARNINGS AND PRECAUTIONS (5.1) and ADVERSE REACTIONS (6.2)]. The most common adverse reactions in the pediatric clinical trials (≥10%) were somnolence, headache, vomiting, extrapyramidal disorder, fatigue, increased appetite, insomnia, nausea, nasopharyngitis, and weight increased.Aripiprazole has been evaluated for safety in 13,543 adult patients who participated in multiple-dose, clinical trials in schizophrenia, another indication, Dementia of the Alzheimer’s type, Parkinson’s disease, and alcoholism, and who had approximately 7619 patient-years of exposure to oral aripiprazole and 749 patients with exposure to aripiprazole injection. 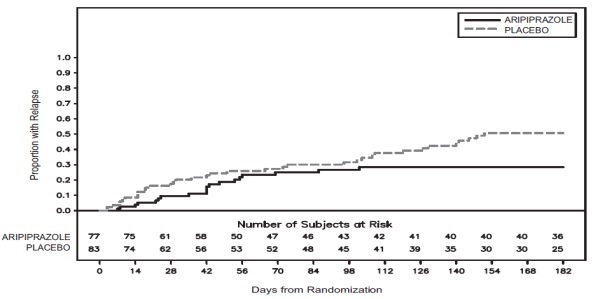 A total of 3390 patients were treated with oral aripiprazole for at least 180 days and 1933 patients treated with oral aripiprazole had at least 1 year of exposure. Aripiprazole has been evaluated for safety in 1,686 patients (6 to 18 years) who participated in multiple-dose, clinical trials in schizophrenia or other indications and who had approximately 1,342 patient-years of exposure to oral aripiprazole. A total of 959 pediatric patients were treated with oral aripiprazole for at least 180 days and 556 pediatric patients treated with oral aripiprazole had at least 1 year of exposure. The conditions and duration of treatment with aripiprazole tablets included (in overlapping categories) double-blind, comparative and noncomparative open-label studies, inpatient and outpatient studies, fixed- and flexible-dose studies, and short- and longer-term exposure.Additional pediatric use information is approved for Otsuka America Pharmaceutical, Inc.’s ABILIFY® (aripiprazole) product. However, due to Otsuka America Pharmaceutical, Inc.’s marketing exclusivity rights, this drug product is not labeled with that information. Table 11 enumerates the pooled incidence, rounded to the nearest percent, of adverse reactions that occurred during acute therapy (up to 6 weeks in schizophrenia, up to 4 weeks in one indication, up to 8 weeks in another indication, and up to 10 weeks in another indication), including only those reactions that occurred in 2% or more of pediatric patients treated with aripiprazole (doses ≥2 mg/day) and for which the incidence in patients treated with aripiprazole was greater than the incidence in patients treated with placebo. Given the primary CNS effects of aripiprazole, caution should be used when aripiprazole is taken in combination with other centrally-acting drugs or alcohol. [see WARNINGS AND PRECAUTIONS (5.8)] Monitor sedation and blood pressure. Adjust dose accordingly. 2 basis) of aripiprazole during the period of organogenesis. Gestation was slightly prolonged at 30 mg/kg/day. Treatment at the high dose of 30mg/kg/day caused a slight delay in fetal development (decreased fetal weight), undescended testes, and delayed skeletal ossification (also seen at 10 mg/kg/day). There were no adverse effects on embryofetal or pup survival. Delivered offspring had decreased body weights (10 and 30 mg/kg/day), and increased incidences of hepatodiaphragmatic nodules and diaphragmatic hernia at 30 mg/kg (the other dose groups were not examined for these findings). Postnatally, delayed vaginal opening was seen at 10 and 30 mg/kg/day and impaired reproductive performance (decreased fertility rate, corpora lutea, implants, live fetuses, and increased post-implantation loss, likely mediated through effects on female offspring) was seen at 30 mg/kg/day. Some maternal toxicity was seen at 30 mg/kg/day however, there was no evidence to suggest that these developmental effects were secondary to maternal toxicity. 2) of aripiprazole during the period of organogenesis. At the high dose of 100 mg/kg/day decreased maternal food consumption, and increased abortions were seen as well as increased fetal mortality, decreased fetal weight (also seen at 30 mg/kg/day), increased incidence of a skeletal abnormality (fused sternebrae)(also seen at 30 mg/kg/day). 2 basis) of aripiprazole from gestation day 17 through day 21 postpartum, slight maternal toxicity, slightly prolonged gestation an increase in stillbirths and, decreases in pup weight (persisting into adulthood) and survival were seen at 30 mg/kg/day. The effect of aripiprazole tablets on labor and delivery in humans is unknown. [see DOSAGE AND ADMINISTRATION (2.1), ADVERSE REACTIONS (6.1), and CLINICAL STUDIES (14.1)]. Although maintenance efficacy in pediatric patients has not been systematically evaluated, maintenance efficacy can be extrapolated from adult data along with comparisons of aripiprazole pharmacokinetic parameters in adult and pediatric patients. Bipolar I Disorder Although maintenance efficacy in pediatric patients has not been systematically evaluated, maintenance efficacy can be extrapolated from adult data along with comparisons of aripiprazole pharmacokinetic parameters in adult and pediatric patients. Aripiprazole in juvenile rats caused mortality, CNS clinical signs, impaired memory and learning, and delayed sexual maturation when administered at oral doses of 10, 20, 40 mg/kg/day from weaning (21 days old) through maturity (80 days old). At 40 mg/kg/day, mortality, decreased activity, splayed hind limbs, hunched posture, ataxia, tremors and other CNS signs were observed in both genders. In addition, delayed sexual maturation was observed in males. At all doses and in a dose-dependent manner, impaired memory and learning, increased motor activity, and histopathology changes in the pituitary (atrophy), adrenals (adrenocortical hypertrophy), mammary glands (hyperplasia and increased secretion), and female reproductive organs (vaginal mucification, endometrial atrophy, decrease in ovarian corpora lutea) were observed. The changes in female reproductive organs were considered secondary to the increase in prolactin serum levels. A No Observed Adverse Effect Level (NOAEL) could not be determined and, at the lowest tested dose of 10 mg/kg/day, there is no safety margin relative to the systemic exposures (AUC0 to 24) for aripiprazole or its major active metabolite in adolescents at the maximum recommended pediatric dose of 15 mg/day. All drug-related effects were reversible after a 2-month recovery period, and most of the drug effects in juvenile rats were also observed in adult rats from previously conducted studies. Aripiprazole in juvenile dogs (2 months old) caused CNS clinical signs of tremors, hypoactivity, ataxia, recumbency and limited use of hind limbs when administered orally for 6 months at 3, 10, 30 mg/kg/day. Mean body weight and weight gain were decreased up to 18% in females in all drug groups relative to control values. A NOAEL could not be determined and, at the lowest tested dose of 3 mg/kg/day, there is no safety margin relative to the systemic exposures (AUC0 to 24) for aripiprazole or its major active metabolite in adolescents at the maximum recommended pediatric dose of 15 mg/day. All drug-related effects were reversible after a 2-month recovery period. [see BOXED WARNING, WARNINGS AND PRECAUTIONS (5.1), and CLINICAL PHARMACOLOGY (12.3)]. [see BOXED WARNING and WARNINGS AND PRECAUTIONS (5.1)]. [see DOSAGE AND ADMINISTRATION (2.7) and CLINICAL PHARMACOLOGY (12.3)]. Aripiprazole has not been systematically studied in humans for its potential for abuse, tolerance, or physical dependence. Consequently, patients should be evaluated carefully for a history of drug abuse, and such patients should be observed closely for signs of aripiprazole tablets misuse or abuse (e.g., development of tolerance, increases in dose, drug-seeking behavior). max of aripiprazole by 50%. : Although there is no information on the effect of hemodialysis in treating an overdose with aripiprazole, hemodialysis is unlikely to be useful in overdose management since aripiprazole is highly bound to plasma proteins. Aripiprazole Tablets, USP are available in 2 mg, 5 mg, 10 mg, 15 mg, 20 mg, and 30 mg strengths. Inactive ingredients include corn starch, hydroxypropyl cellulose, lactose monohydrate, crospovidone, colloidal silicon dioxide, magnesium stearate and microcrystalline cellulose. Colorants include ferric oxide (yellow or red). 2 receptors similar to the parent drug and represents 40% of the parent drug exposure in plasma. The mean elimination half-lives are about 75 hours and 94 hours for aripiprazole and dehydro-aripiprazole, respectively. Steady-state concentrations are attained within 14 days of dosing for both active moieties. Aripiprazole accumulation is predictable from single-dose pharmacokinetics. 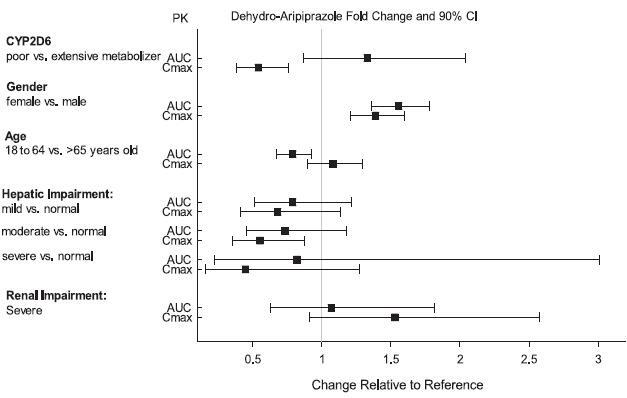 At steady-state, the pharmacokinetics of aripiprazole are dose-proportional. Elimination of aripiprazole is mainly through hepatic metabolism involving two P450 isozymes, CYP2D6 and CYP3A4. For CYP2D6 poor metabolizers, the mean elimination half-life for aripiprazole is about 146 hours. max by 3 hours for aripiprazole and 12 hours for dehydro-aripiprazole. 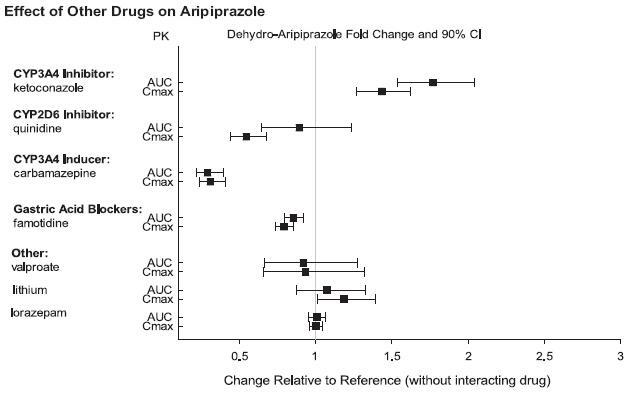 2 receptor occupancy indicating brain penetration of aripiprazole in humans. in vitro studies, CYP3A4 and CYP2D6 enzymes are responsible for dehydrogenation and hydroxylation of aripiprazole, and N-dealkylation is catalyzed by CYP3A4. Aripiprazole is the predominant drug moiety in the systemic circulation. At steady-state, dehydro-aripiprazole, the active metabolite, represents about 40% of aripiprazole AUC in plasma. 14C]-labeled aripiprazole, approximately 25% and 55% of the administered radioactivity was recovered in the urine and feces, respectively. Less than 1% of unchanged aripiprazole was excreted in the urine and approximately 18% of the oral dose was recovered unchanged in the feces. max and AUC values at steady-state is expected in poor metabolizers of CYP2D6 administered with strong CYP3A4 inhibitors. in vivo micronucleus assay in mice; however, the response was due to a mechanism not considered relevant to humans. 2basis) of aripiprazole from 2 weeks prior to mating through day 7 of gestation. Estrus cycle irregularities and increased corpora lutea were seen at all doses, but no impairment of fertility was seen. Increased pre-implantation loss was seen at 6 and 20 mg/kg/day and decreased fetal weight was seen at 20 mg/kg/day. 2basis) of aripiprazole from 9 weeks prior to mating through mating. Disturbances in spermatogenesis were seen at 60 mg/kg and prostate atrophy was seen at 40 and 60 mg/kg, but no impairment of fertility was seen. 2 and 7 to 14 times human exposure at MRHD based on AUC. Evaluation of the retinas of albino mice and of monkeys did not reveal evidence of retinal degeneration. Additional studies to further evaluate the mechanism have not been performed. The relevance of this finding to human risk is unknown. One maintenance monotherapy trial in adult patients with bipolar I disorder (14.2). Aripiprazole Tablets, USP have markings on one side and are available in the strengths and packages listed in Table 14. Store at 20° to 25°C (68° to 77°F); excursions permitted to 15-30°C (59-86°F) [See USP Controlled Room Temperature]. and indicate a need for very close monitoring and possibly changes in the medication [see WARNINGS AND PRECAUTIONS (5.3)].Prescribers or other health professionals should inform patients, their families, and their caregivers about the benefits and risks associated with treatment with aripiprazole and should counsel them in its appropriate use. A patient Medication Guide including information about “Antidepressant Medicines, Depression and other Serious Mental Illness, and Suicidal Thoughts or Actions” is available for aripiprazole. The prescriber or health professional should instruct patients, their families, and their caregivers to read the Medication Guide and should assist them in understanding its contents. Patients should be given the opportunity to discuss the contents of the Medication Guide and to obtain answers to any questions they may have. It should be noted that aripiprazole tablets are not approved as a single agent for treatment of depression and has not been evaluated in pediatric major depressive disorder. [see WARNINGS AND PRECAUTIONS, (5.7)]. [see WARNINGS AND PRECAUTIONS (5.13)]. ABILIFY® is a trademark of Otsuka Pharmaceutical Company. Increased risk of death in elderly patients with dementia-related psychosis: Medicines like aripiprazole can raise the risk of death in elderly people who have lost touch with reality (psychosis) due to confusion and memory loss (dementia). Aripiprazole is not approved for the treatment of patients with dementia-related psychosis. .Antidepressant medicines may increase suicidal thoughts or actions in some children, teenagers, and young adults within the first few months of treatment.2. Depression and other serious mental illnesses are the most important causes of suicidal thoughts and actions. Some people may have a particularly high risk of having suicidal thoughts or actions. These include people who have (or have a family history of)bipolar illness or suicidal thoughts or actions. How can I watch for and try to prevent suicidal thoughts and actions in myself or a family member? •Pay close attention to any changes, especially sudden changes, in mood, behaviors, thoughts, or feelings. This is very important when an antidepressant medicine is started or when the dose is changed. •Call the healthcare provider right away to report new or sudden changes in mood, behavior, thoughts, or feelings. •Keep all follow-up visits with the healthcare provider as scheduled. Call the healthcare provider between visits as needed, especially if you have concerns about symptoms. Do not take aripiprazole if you are allergic to aripiprazole or any of the ingredients in aripiprazole. See the end of this Medication Guide for a complete list of ingredients in aripiprazole. Before taking aripiprazole, tell your healthcare provider about all your medical conditions, including if you have or had: •diabetes or high blood sugar in you or your family; your healthcare provider should check your blood sugar before you start aripiprazole and also during therapy. •low or high blood pressure. •pregnancy or plans to become pregnant. It is not known if aripiprazole will harm your unborn baby. •breast-feeding or plans to breast-feed. Aripiprazole can pass into your breast milk and may harm your baby. Talk to your healthcare provider about the best way to feed your baby if you receive aripiprazole. •low white blood cell count. Tell your healthcare provider about all the medicines that you take, including prescription medicines and over-the-counter medicines, vitamins and herbal supplements. Take. Keep a list of your medicines to show your healthcare provider and pharmacist when you get a new medicine. How should I take aripiprazole? •Take aripiprazole exactly as your healthcare provider tells you to take it. Do not change the dose or stop taking aripiprazole yourself. •Aripiprazole can be taken with or without food. •Aripiprazole tablets should be swallowed whole. •If you miss a dose of aripiprazole, take the missed dose as soon as you remember. If it is almost time for the next dose, just skip the missed dose and take your next dose at the regular time. Do not take two doses of aripiprazole at the same time. •If you take too much aripiprazole, call your healthcare provider or poison control center at 1-800-222-1222 right away, or go to the nearest hospital emergency room. What should I avoid while taking aripiprazole? •Do not drive, operate heavy machinery, or do other dangerous activities until you know how aripiprazole affects you. Aripiprazole may make you drowsy. •Avoid getting over-heated or dehydrated. OIn hot weather, stay inside in a cool place if possible. OStay out of the sun. Do not wear too much or heavy clothing. Unusual urges. Some people taking aripiprazole have had unusual urges, such as gambling, binge eating or eating that you cannot control (compulsive), compulsive shopping and sexual urges. Orthostatic hypotension (decreased blood pressure). Lightheadedness or fainting when rising too quickly from a sitting or lying position. •Problems with control of your body temperature especially when you exercise a lot or are in an area that is very hot. It is important for you to drink water to avoid dehydration. Increased saliva or drooling • muscle stiffness These are not all the possible side effects of aripiprazole.Call your doctor for medical advice about side effects. You may report side effects to FDA at 1-800-FDA-1088. How should I store aripiprazole? •Store aripiprazole at 20° to 25°C (68° to 77°F); excursions permitted to 15-30°C (59-86°F) [See USP Controlled Room Temperature]. General information about the safe and effective use of aripiprazoleMedicines are sometimes prescribed for purposes other than those listed in a Medication Guide. Do not use aripiprazole for a condition for which it was not prescribed. Do not give aripiprazole to other people, even if they have the same condition. It may harm them. You can ask your healthcare provider or pharmacist for information about aripiprazole that was written for healthcare professionals. For more information about aripiprazole call Alembic Pharmaceuticals Limited at 1-866-210-9797. Inactive ingredients: corn starch, hydroxypropyl cellulose, lactose monohydrate, crospovidone, colloidal silicon dioxide, magnesium stearate and microcrystalline cellulose. Colorants include ferric oxide (yellow or red). 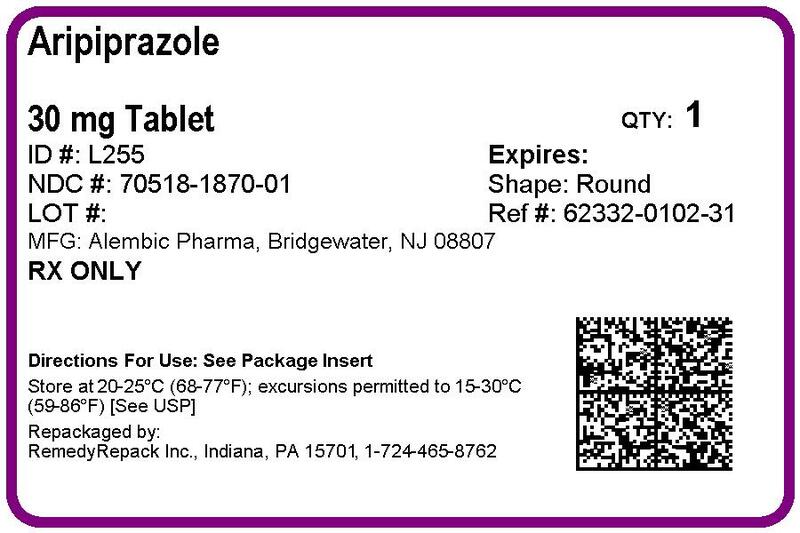 Additional pediatric use information is approved for Otsuka America Pharmaceutical, Inc.’s ABILIFY® (aripiprazole) product. However, due to Otsuka America Pharmaceutical, Inc.’s marketing exclusivity rights, this drug product is not labeled with that information.This Medication Guide has been approved by the U.S. Food and Drug Administration.ABILIFY® is a trademark of Otsuka Pharmaceutical Company.